The PORTA PRIVY is the fastest way to provide privacy. It sets up or is put away in just a few seconds using steel Memory Loops instead of clumsy poles. 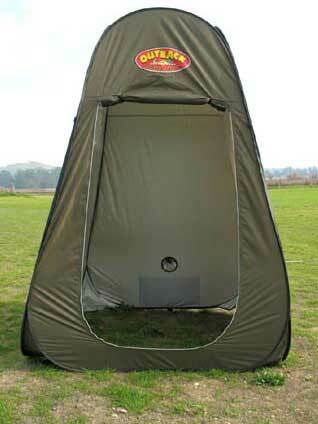 Works great as a bathroom shelter or shower tent.� Not just for camping, the Porta Privy is also a great instant up changing room by the pool or at the beach when skin and scuba diving, surfing, kayaking or sailboarding. To set up the Porta Privy, you just toss it in the air, unfold it, stake the corners and install the support lines if needed. To fold it up just grab the sides about 12" up from the bottom (too high up and it won't work).� Place the bottom against your abdomen.� Quickly raise your hands up slightly to get the top to bow down.� Then touch your thumbs together.� That's it!� Takes a little practice, but once you get it, it's easy as pie.